I apologize. In 2.3.0 i used the function createDirectoryAtURL, but i have not looked that it appeared only in iOS 5.0. To work around this problem, you can remove mail access from the API Key (remove all flags from the section Communications). Серверу CCP нужно какое-то время чтобы применить изменения. Попробуйте минут через 5. I've seen one instance of a crash reading messages on iOS 5.0.1 as well. In this case the message showed as being to , and the crash was on attempting to open the message. 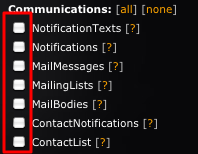 The message was actually to a mailing list (though in EVE Gate it shows with a blank To: line), the mailing list name contains the characters '.' and '-' as well as some letters, and the message contained a link. Sorry I can't provide more details. Workaround doesnt do it on 4.2.1 ( jailbreaked ). Crashes immediately after splash. i use more than one API - all keys are modified like suggested above. Hope there is a solution but upgrading my ios. Is there an update planned soon? Ok, same guy as last one (broken loading). I've found a workaround for those who are stuck too: delete app, change Api to not include communications category and reinstall app. It will delete all your fits, but hey, it just makes it more fun to do them again (and gives you the opportunity to update them). There you go, hope this helps. It deletes the stored APl if you uninstall the app I assume? You can backup accounts.plist and fits.plist files through iTunes. After reinstalling EVEUniverse you can put it back. I already submitted fix to AppStore. I hope Apple will finish the review this Friday. So, I deleted and reinstalled to get the app working again, but its showing ads now. Tried sync'ing to itunes, wiped out the keys I had just added and is still showing ads. I can't restore the status of the inapp purchase itself. This is ios limitations. You have to donate again. If you paid earlier the second time it will be free. Love the app, but, would love to see blueprint skill requirements in the info/database section. Above poster here. Wasn't meaning to come across as rude. I really do love the app. This site is a bit buggy with my iPhone browser. I'm finding the fitting tool very unstable in the latest release. I'm using an up-to-date 4S and have followed the above workaround steps to prevent the startup crash. I am getting an intermittent crash whilst fitting modules. I'm rarely able to fit more than four modules before crashing. In addition to the above-mentioned skill requirements on blueprints, how about the bill of materials? And if so then be able to determine your actual bill of materials based on your skills. Perhaps as a separate tool, either way would awesome. Another suggestion here! I see that the new asset manager has collapsible tabs which is awesome, and I think that a cool upgrade would be to add that feature to the skills viewer! Thanks and this is the best app out there by far! Артем, здравствуйте. После вчерашнего обновления при любой попытке зафитить корабль, либо подгрузить фит с батлклиника, либо посмотреть фит созданный в предыдущей версии приложение вылетает. Очень не хватает этой востребованной функции. У вас нет идей почему это происходит ? Я так полагаю, у вас iPad? Это моя оплошность. Я забыл сделать очистку проекта перед тем как собрать билд для AppStore. В результате один интерфейсный файл для iPad версии не перекомпилировался и остался от старой версии. Поэтому приложение и вылетает. На айфоне все должно работать. Я буду загружать исправленый билд в AppStore сегодня, но Apple очень долго проводит ревью. Так что придется запастись терпением где-то на неделю. Спасибо что так быстро реагируете. Приложение отличное, функционал выше всяких похвал !